These examples prove that buy-and-hold investing can really pay off, especially if you start with high-quality companies. 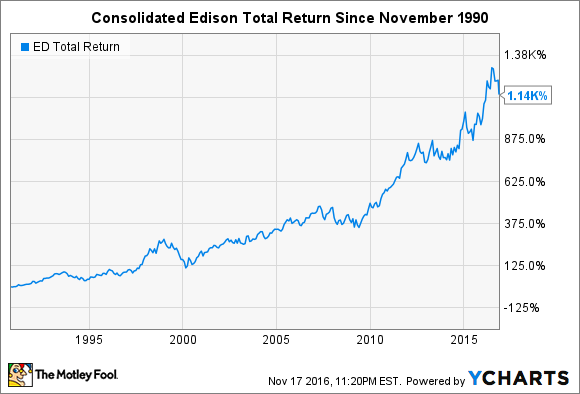 The gains Consolidated Edison has achieved over the last five years have been just over half of what the S&P 500 returned when dividends are factored into the comparison. Still, the energy and utility company has delivered unquestionable value over the longer term. An initial investment of $8,000 in November 1990 would equal $90,400 today. The company has struggled to grow revenue in recent years, bouncing between $12.2 billion and $12.9 billion since 2012. It has managed to grow EPS in each of the last three years, but expects a small decline in 2016. The near-term future of utilities comes with a relatively moderate degree of uncertainty as new power production systems are worked into regulatory frameworks and as volatile weather impacts operations. Consolidated Edison seems well positioned to continue growing profits -- thanks to renewable energy projects and expanding natural gas services in the Northeast -- and paying out a handsome dividend, which currently yields 3.9%. Coca-Cola has also significantly underperformed the S&P 500 in the last five years. Its gains have been less than half of what the broader index returned when dividends are included for both. But the comparison isn't even close over the long term. Had you invested $8,000 in the soft drink giant in November 1990, you would have $92,800 today. 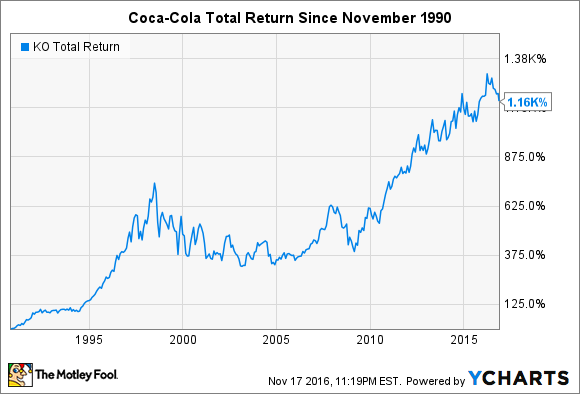 Coca-Cola stock soared over 1,130% in the 10 years after the artificial sweetener aspartame was approved by the Food and Drug Administration in 1983. Its beverages' continued popularity in the late 1990s, coupled with global expansion, helped the company's shares continue their epic rise in the last several decades. And by capitalizing on new consumer diet trends and expanding its global footprint, it should be able to drive further growth. For example, the recent opening of Coca-Cola Beverages Africa, its acquisition of healthy brands including ZICO coconut water and a minority equity stake in Suja Life cold-pressed juices, as well as the potential to shift to plant-based zero-calorie sweeteners in the stevia family could underpin the next chapter of the company's growth story. 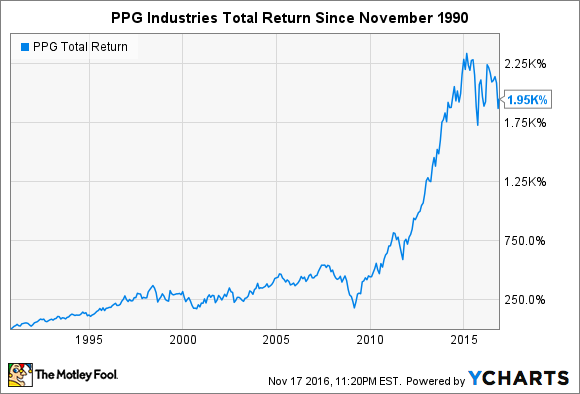 Unlike the first two stocks on this list, PPG Industries has smoked the S&P 500 in total returns over the last five years. It's also been the best performer over the last 26 years in this group: An initial investment of $8,000 would have turned into $154,400 when dividends are included. The coatings and specialty materials manufacturer has steadily grown revenue from $12.7 billion in 2012 to $15.3 billion in 2015. More impressive is that EPS grew from $1.80 in 2012 to $5.14 last year. That should continue as PPG Industries doubles down on growth through acquisitions and reinvestments in its highest margin businesses, including certain industrial and performance coatings. As Consolidated Edison, Coca-Cola, and PPG Industries demonstrate, one of the best ways to build wealth is to buy shares of great companies and hold onto them for a very long time. Investors shouldn't expect these stocks to deliver 1,000% returns from here on out (at least, not anytime soon), but each is well-positioned to continue delivering growth to investors.